Anyway, did these just now come out, or have they been in sets for the last year that I've been away from LEGO? 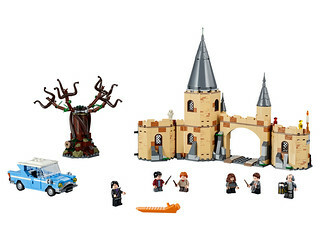 They do not appear to be in the HP sets currently in stores (btw, the Of course the obvious question is why didn't they come up with these years ago when they were doing Tolkien sets, as half the main characters were hobbits and dwarves? 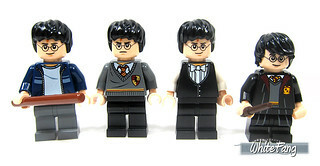 That seems a more compelling use for them than just for the HP characters, who have been long depicted with normal minifig legs. From WhiteFang's review over on Eurobricks these are slightly taller than the immobile "stubby" legs, and it looks like these legs are in plain blue, plain black, and a couple of different variations that are black with "Hogwarts robe" printing. Maybe white, but it's hard to tell as that photo was taken against a white background and so it is hard to see - I think those might be the old style "stubby" legs. Also, note that the robe part is not just a tall slope brick. I'm assuming this is a brand new part? 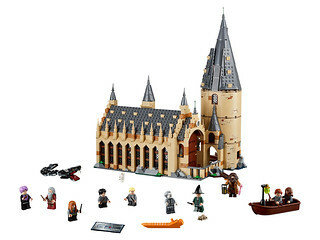 Though it looks like that one is in the Hogwarts Great Hall set currently in stores. BTW, that mouse on the left is new to me, looks like it was in a recent CMF fig. 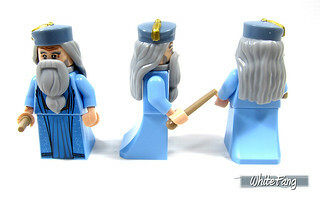 I think for castle use I'd get that fig (it also has the new legs), the Voldemort, and the Dumbledore. A few pieces stand out to me, though I'm sure they've already been discussed around here. Anyway, I hope all is well around here. BTW, is it me, or has bricklink gone out of their way to make linking pretty much impossible. I kept getting broken links when I tried to connect there in this post, so had to go back and change some to Brickset, and the images to things I found on Flickr or just downloaded images and uploaded them to my own Brickshelf so I could post them. Thank you for sharing your thoughts on the new harry potter pieces. I agree that these will be great for castle. Fans have been waiting for years to get candle, flame, and a rectangular window lattice element. It would be nice to have the taller 2x3 lattice element in the future. The moveable short legs will be useful across all themes. The Dumbledore robe piece appears to be new as well. His headgear will also be nice for castle mocs. As far as I know, those middle length legs are brand new to those Harry Potter CMFs. I'm not as hyped up as some people are, but they are quite cool. Certainly does make those HP CMFs more of a draw to non HP fans. The new dress slope is new, but I believe at least one of the SW Last Jedi sets (With the red guards) had it. I certainly want a bunch of those square lattice windows, but Unsure if I will shell out the cash for whatever the castle is. But we shall see. Candles are awesome too, didn't notice that before. Oh Ben and Bruce must be important. Anyways I'm quite happy with these new element. I just hope those shorter legs became available in more colours with future sets. As for the others non-minifig parts they look quite nice especially the torch and flame. All of the above except for those leaf parts make me squeal in delight. But not as much as the Disney Princesses do...but still it is a close second. Yay for HP awesomeness! Yes plants with leaves bigger than one's head actually do exist. But...one of them is highly poisonous and that is exactly what I think about when I see that new leaf part. Yup, this CMF series has some great parts. I'm quite excited about the 'teenager' legs, and the square lattices will be super useful too. Interesting. 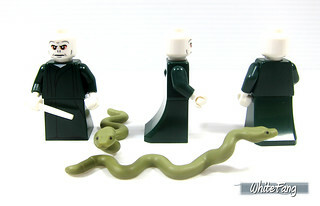 I didn't realize there was an HP CMF series, nor did I realize there were so many new-ish parts. Looks great! I have built my case of figs. I have built the Whomping Willow Set, the smallest spider set, Newt's suitcase, and the carriage from Fantastic Beasts. I am thrilled! Of those, Newt's suitcase has to be hands down the coolest little build. The way they did everything was just different and good. The details are really great. My only minor complaint is...brown, dark brown and black...all in one set. My eyes were SO not happy or able to tell many times. But that is minor. I dont' care so much about the big beast but they are really well done. The figs...oh they made me happy. Just a good one. Whomping Willow...we got Shamis! We've never had him or Filch before and they both are just cool! The Whomping Willow was very strange while building. I'd have given it more branches, but I know why they didn't. It's good. First time they ever put the white stripe that is on the car...on the car. The carriage...black friends plant! You know the one with the cool curl on the top. SO SO SO useful in many things. And purple wands plus great figs. The collecti figs...all I can say is WOOOW. Each one made me smile. Even the ones other people are completely meh about. Funny thing is...the only one I am meh about is Grindelwald. Or however you spell it. There isnt' anything special to him except he is only 1 in a case..and has 2 wigs. There are suitcases, new food, new tiles, new colors of hotdogs and buns, triwizard cup...on and on in all the others...NIFFLER! But Grindelwald...just a second wig. The new moving legs...SWEET! The candle and flame..oh yes..please..I need like 9423817650139467 of those. Now I just need to get the rest that I don't have...money needs to start growing on trees around me.